Note: I used boneless fillets. If you don’t have boneless fillets you can use normal fish pieces. Yogurt should be thick & should not contain water. Wash & squeeze out excess water from fish. Pierce fish using fork or tooth pick. Keep aside. In a bowl mix all the ingredients to make paste. Cover & refrigerate for 2-3hrs. Preheat the oven for 10mins at 300 degree Celsius (572 degree Fahrenheit). Cover the baking tray with aluminum foil to avoid the tray from stains. Note: You can put a layer of carrot pieces and onion slices on top of the foil to avoid fish sticking to foil. Transfer marinated fish to tray. Place tray in middle of the oven. Bake it for 15-20 minutes or till it gets brown spots & dry. Flip the fish to bake other side till you see brown spots. Note: Baking time may differ, check in between if fish is done. Don’t flip fish if it is still wet it may break in to pieces. Spicy Baked Fish is ready. Sprinkle coriander on top & serve with Lemon wedges. 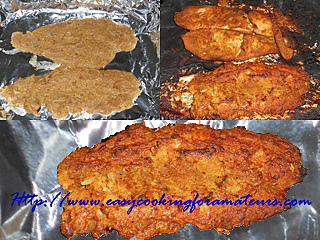 wow..baked fish looks yummy..bookmarked,will surely try this out..
Wow ~ that looks great ~ perfectly done! Spicy baked fish looks delicious. Brilliant ! That's all I can say. Your fish looks wonderfully baked. Loved the crispiness of it. this looks like a very yummy, spicy dish! love it! Looks so good, perfectly done! this fish dish is so flavourful. Loved your collection of recipes. Mouthwatering here, delicious baked fish,simply tempting! WOW>..That is one tempting, baked fish!! Great looking fish dish! I am sure it's great in taste! Thanks for sharing and have a great week! I like above the recipe. Its very tasty and health food for everyone. Preparation steps are really useful information for everyone. I am huge fan of your blog. 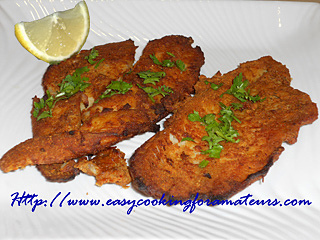 Aaha.. love the baked fish.. looks crispy and flaky.. bet it tasted great..